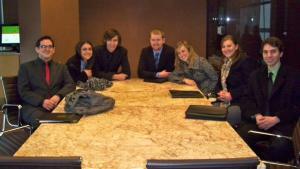 On Friday March 2, I traveled with seven other PRSSA members to Chicago for my first agency tour. Unlike our other tours, this one was a two-for-one deal. First, we visited Edelman and then L.C. Williams & Associates. 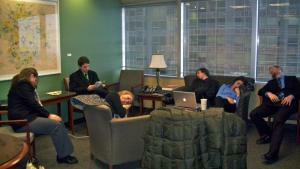 The trip started out bright and early at 6 a.m. After a long drive and some much-needed caffeine, we arrived at Edelman. Employees of the company described Edelman’s PR professionals as a resource for their clients, trusted advisers and strategic partners. Some of Edelman’s clients include Humana, True Value, Blackberry, Pull-Ups, Hilton and Best Buy. The presentation began with a greeting from a panel of six employees ranging from assistant account executive to senior account executive. Jillian Collins, ISU PRSSA alumnus, was among the panel members. The session began with a question-and-answer discussion. Illinois State University was not the only chapter in attendance, other PRSSA chapters from DePaul and University of Illinois-Champaign accompanied us at the panel as well. Panel members emphasized the need to be well-informed by using media monitoring as well as staying current with events and trends in order to give clients a “big picture” outlook. Other notable skills and tips included the basics: writing, flexibility and diverse experience. One employee suggested coming into a firm such as Edelman being “battle ready,” because Edelman strives to hire individuals willing to fight for success. In order to be battle ready, one should plan ahead, get involved in school, and build a professional networkbefore you actually need it. After the Q&A session, Collins treated us to a tour of the facilities. The office was spread out over several floors. Employees were allowed to dress casually and decorate their cubicles as they pleased. 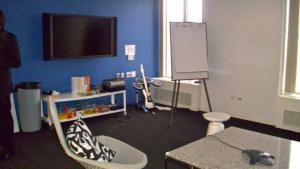 Highlights of the space included a “play room” equipped with video and board games and a digital conference room featuring technology that allowed for video chats with clients and other Edelman offices. In addition, the meeting rooms were named after different innovations that originated in Chicago, such as Lincoln Logs. The walls and tables of these meeting rooms were made of whiteboard surfaces to support visualization. When the tour was completed, the group headed to Macy’s food court for a luncheon with alumni. We met with ISU PRSSA alumni Collins, Kaitlin Nickrent, Stephanie Dockery and Dan Schacter. After some reminiscing, the alumni returned to their jobs at Greentarget, Edelman and L.C. Williams. After lunch, we headed for a spur-of-the-moment visit to Illinois State University’s Alumni Center. For some of us, this was our first visit to the Alumni Center. We were greeted with open arms and greatly appreciated their hospitality. Next we moved forward to our tour at L.C. Williams and Associates. The L.C. 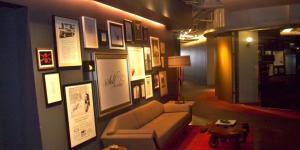 Williams office had a different feel compared to Edelman’s larger-scale office. The L.C. Williams staff included 30 members (compared to Edelman’s 600+) and considered themselves to be a mid-sized agency. Clients of L.C. Williams were mostly in the home-care realm, but also included big names like Tiffany & Co. and eBay. The layout was very modern and comfortable. The offices were coveted by most of our group members because of their large sizes and fantastic city views. My favorite feature was an interview room, which allowed clients to practice the experience of an on-camera interview while being asked questions from L.C. Williams’ PR professionals. We heard from four presenters, including ISU alumni, Nickrent and Lauren Platt. Members listened to an overview of each individual’s day-to-day jobs as well as advice they wished they received when they were in our shoes. Some advice included being able to take constructive criticism, showing initiative and being familiar with the media-monitoring program, Cision. The presentation concluded with tips for applying for internships, which included personalizing your application to the company and a 10 item maximum portfolio. After a very long, yet informative day, we headed home in current PRSSA member, TJ Syndram’s, cozy van and stopped for a delicious dinner at Portillos (also a first for me). Overall, the tour was a great professional experience and gave me a firsthand look into the world of agency PR. PRSSA members taking a quick "nap" at the alumni center before our next stop! 1. What has been your favorite memory of PRSSA? My favorite memory of PRSSA has to be the 2009 National Conference in San Diego. It was at this conference that I met and got to know two of my closest friends in PRSSA, Genevieve Prendergast and Deirdre O’Brien. The following year, I worked with Genevieve on the 2010-2011 executive board and with Deirdre within the School of Communication’s Creative Services group. I still often seek their advice in and outside of PRSSA. 2. What internship taught and helped you the most? Although I have had several internships, the one that has taught me the most was my internship with the School of Communication’s Creative Services. It was there that I was able to take my passion of social media and apply it to real-world practice. I learned that there is more than simply using a hashtag to interact with online audiences. You have to know your target audience and make sure your message is clear in order to get it across. 3. What was your favorite executive board position and why? I can honestly say that I do not have a favorite over the two positions I have held. Each position has had its opportunities and challenges. The different circumstances I faced helped make me into the person that I am now. Each position was a lot of work, involvement and sometimes stress. However, each moment was worth it. I am proud of what I have learned and achieved, as well as the people I have had the opportunity to work with. Cars have always been a passion of mine. If you ask anyone who works with me, they will tell you that about every other word out of my mouth has something to do with the automotive industry. So I dream of working for an automotive company that produces high-performance vehicles. Particularly, I would like to be able to design and implement a national campaign that introduces potential customers to cars through grassroots tactics (e.g., test drives, testimonials, real world) and combine them with large-scale promotions, like product placement. I would like to ensure that this campaign exemplifies the passion that the rest of the automotive industry has. This would also involve taking advantage of all the online blogs and forums to establish strong and loyal customer base. 5. What was your favorite class? My favorite class of my college career is COM 321 Campaign Communication & Message Design. It was in this class that I was able to examine several campaigns and analyze the weak and strong points. I was also given the opportunity to design a theoretical campaign for General Motors. 6. What was your least favorite class? My least favorite class of my college career was my geometry class freshman year. Normally I am okay with geometry, but not when my lab time was 8 a.m. on Fridays! 7. If you can relive one memory, what would it be and why? One of my favorite memories that I would love to relive is my first PRSSA conference (2008) in Detroit. I was already thrilled just to be near General Motors headquarters, but it was during this conference that I was able to really experience public relations in the automotive world. 8. If you can be anything in the world besides a public relations professional, what would it be? I would be a professional racecar driver. I love to drive anything with wheels! My celebrity crush would have to be Zoey Deschanel. I have always liked her quirkiness. 10. What advice would you give to future and present PRSSA members? If I could give one piece of advice to future and present PRSSA members, it would be to take as many chances as you can. Yes, I realize this sound cliché, but I guarantee it’s worth all the risk. I took several chances during my time here at ISU, some paid off and some didn’t, but overall they made be a better professional and a better person. 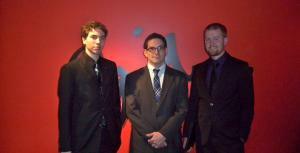 On February 24, 2012, our Chapter took a tour of Ogilvy’s Chicago office. Account Executive, Bradley Silber, and Assistant Account Executive, Paul Vietmeyer, gave us a brief overview of the company, tour of the office and answered any questions we had. 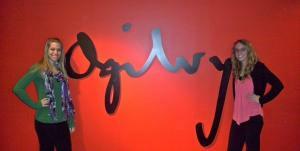 Ogilvy is an international company with offices in over 120 countries and some of the largest clients on the market. The Chicago office handles several large clients including LG, IBM, American Express and Ford. Silber explained that 2011 was a big year for the Chicago office because they managed to gain new clients, while most agencies were losing business due to the economic climate. Vietmeyer walked us through a case study of the work Ogilvy had done for Slim Fast. The campaign promoted Slim Fast to a wider audience by partnering with Filene’s Basement for their Running of the Brides event. Vietmeyer spoke about the importance of matching the brand with the event. The Running of the Brides is a one-day sale of designer bridal dresses at largely discounted prices. Ogilvy was able to position Slim Fast as a product to help brides slim down and fit into that perfect dress for their big day. The move worked better than anyone had originally expected and generated 430 million media impressions for the client. Ogilvy is one of the largest and well-known Public Relations firms in the world. The company has managed to retain its legacy of strength, creativity and respect while adapting to today’s ever-changing market and new forms of media. “We exist to build the business of our client… without regard to our own short-term interest. This earns us their respect, which is the greatest asset we can have,” David Ogilvy. The executive board: Ian De La Rosa, Lauren Trentadue, Michelle Ketcham, Kaitie Ries and Brian De Pasqua. The lobby displaying various awards and articles about their clients. Emma Newman and Allyson Corona pose for a picture just outside Ogilvy’s office. 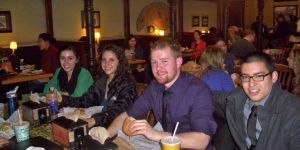 After a long day of networking, we stopped for lunch at Potbelly. Refueling on Potbelly before the long drive back to ISU.